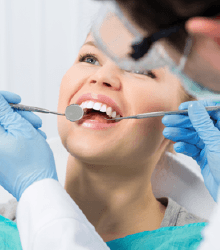 In some cases, you can avoid dental damage and tooth decay with healthy habits, but when unexpected damage or decay occurs and you’re in need of urgent car, the Torbram Dental team in Brampton is here to help with emergency dentistry services. In some cases, we’ll be able to see you right away, and we are always happy to walk you through pain management and first aid steps you can take to remain comfortable until you reach our office. If you have questions or you’re experiencing a dental emergency, call our Brampton dental office as soon as possible. We’ll get to work helping you to renew your oral health, so you can get the smile back on your face as soon as possible. When you’re experiencing a dental emergency, one of our team members will be happy to help you with managing your symptoms, but below, you’ll find out more information about how to respond to some of the most frequent dental emergencies. If you’ve lost a tooth, the best option is to replace it in the vacated socket. Rinse out your mouth and clean off the tooth with cool water. Then, simply replace the tooth. Bite down on a piece of gauze or clean cloth to hold the tooth in place. If you can’t replace the tooth, store it in a container of milk or water until you reach our office. If your tooth is damaged, retrieve any large pieces that break away and bring them to your appointment. To protect your surrounding teeth and oral structures, cover any sharp points with orthodontic wax. 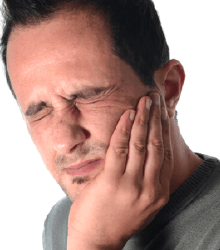 If you’re experiencing severe toothache or lingering sensitivity to heat or cold, you may need root canal therapy. This procedure is necessary when tooth decay or damage accesses the innermost layer of the tooth, the pulp, where the tooth’s nerve is housed. We can remove the pulp and nerve tissue and place a dental crown to fully repair the lost form and function of your smile. If you have food or other items stuck between teeth, use floss to gently remove the item. You can also brush the area around the stuck item, but don’t use sharp tools as you may unintentionally damage surrounding teeth and soft tissues.